Dean River Steehead start to enter the river in June and continue to run in waves throughout the season. The average fish is 10-12 lbs. but some reach 25-30 lbs. They take the fly readily from the time spring runoff ends in mid June to the end of the fishing season on September 30. Dean River Chinook enter the river in June and July and can reach 60 lbs. These powerful wild salmon can be caught on flies and are a challenging quarry in the fast flowing Dean. Northern Coho salmon enter the Dean in late August and September and can reach 20 lbs. Due to DFO's terrible management of the salmon resource we require that all salmon be released. The river opens June 1 and the area we fish is "FLY ONLY" from July 15 to season's end Sept 30. 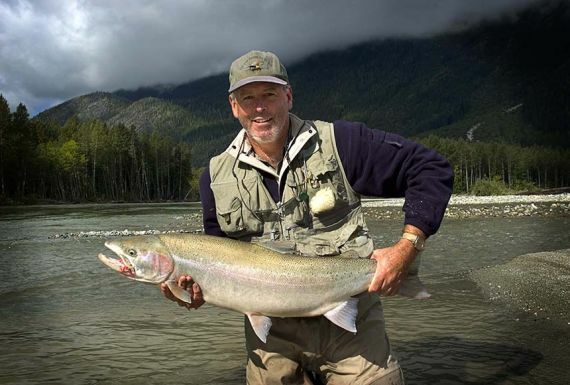 The Steelhead fishery is CATCH & RELEASE throughout the season.